Bring a notepad and pen – Here’s What You Can Learn – courtesy of Tim Bilyeu who does such a great job of bringing us fantastic content – one of the best collections of LifeHacks I have seen. Invest these 30 minutes in yourself today – some great and surprising nuggets. 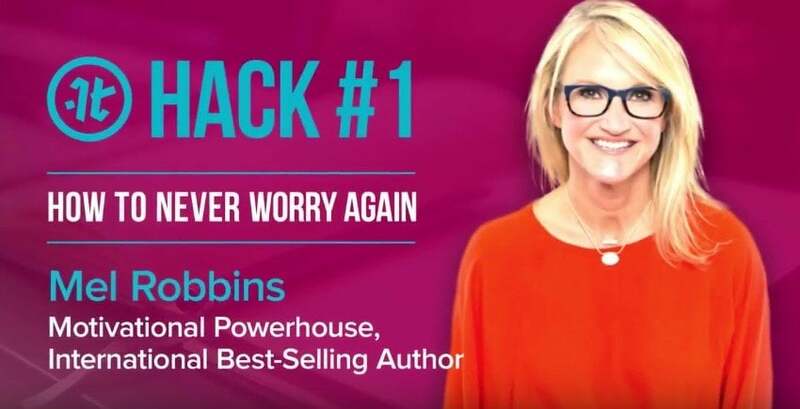 I want to start with something we can all relate to and that is how do you stop worrying and how do you stop listening self-doubt. This is how you're going to do it. So all day long you're going to have moments where your thoughts drift and I use that word on purpose because for me there is a physical sensation when you start to use the five second rule and you start to wake up not only on time in the morning but you wake up to your life and the opportunities in your life. There's your thoughts drift like you'll just be hanging out with your friends and then suddenly you're like I'm not sure that the person likes me and you know I haven't heard from my kids lately I wonder if they're dead or you know you know as quick check like you just start worrying about stuff. Why. Because it's a habit because when you're not paying attention your brain shifts from you being a decision maker and paying attention to you just kind of spinning things on autopilot. And one of your habits is worrying the second you wake up and you notice. Holy cow I'm talking some negative garbage to myself right now. Five four three two one. You've just shifted the part of the brain that you're using. You've shifted from the basal ganglia which is where your habit loops are spinning and You've awakened your prefrontal cortex. You've also interrupted that pattern. Now what you're going to do because your mind is actually ready to receive a different thought because of the counting. Now you can put in an anchor thought like if you have a monitor if you've got a vision about the way that your business is going to turn out in five years if you just have a thought that makes you really happy and proud insert that now why does this work. It works because of the counting. And I'm not kidding. We know based on research the positive thinking alone not effective in some instances trying to force yourself to think positive can actually make the worries worse. Why. Well the reason why is because it's really hard to just change the channel. What we have to do first is basically interrupt it and turn off the TV and then turn it back on with the prefrontal cortex awakened. So the counting is essential and so you can start using this today. You catch yourself talking garbage to yourself. Five four three two one. Switch it back. Get back to that vision that you have about toasting your success sir. This customer being really happy are you being proud of yourself whatever that vision may be. You can control your thoughts and this is not just us talking about it this is a tool that you can use. Number two how to set better goals. The first lesson you ask yourself to identify you goals is what experiences do I want to have in life and this is where you start writing down your experiences. And you know when I do this exercise I ask people to take out a piece of paper drop three call them so if you're watching do that right now take out a piece of paper.